The Abus Folding Lock 6500 Bordo Granite X-Plus has a total length of 85 cm and is available in black, red or white. The manufacturer promises you very good protection in case of high risk of theft and certifies the lock with a maximum safety level of 15. The individual rods are 5.5 mm thick and have a soft 2-component sheath for protection against paint damage on your bike. 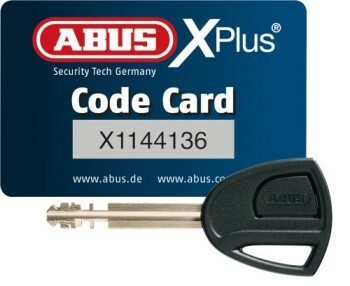 When ordering the Abus 6500 Bordo Granite X-Plus, you will also receive a transport bag. The Bordo Granit X-Plus 6500 Abus is the absolute top product from the Bordo Castle family — it is the test winner by Stiftung Warentest in the field of Folding . The lock is also relatively favorable for this position, it is already for about 90 € either in the color red, black or white to have. No matter how valuable the bike is, with this bike lock the bike is extremely well protected. The ABUS bicycle lock is characterized by a solid quality and especially its compactness. It can be folded up very small by the folding method and attach great in the transport ash it supplied to the bottle holder of the wheel — this is with rattling protection. In addition, the lighting of the key in the dark makes a very good figure, never again vainly looking for the keyhole. Furthermore, the lacquer is well protected, through a 2-component rearrangement it can not come to scratches on the lacquer through the bicycle lock. In this point, the bicycle lock offers everything a very good lock has to afford. The manufacturer indicates the security level of the bicycle lock with 15 of 15 possible , what we and foundation can confirm Warentest. There cuts in the range security against being broken with 2.0 — so that it is the winner among Faltschlössern . We were also unable to find a weak spot with our test tools. With the bolt cutter there were already problems with the attachment and the saw blade of the metal saw gave up the mind.Moreover, it is of course ADFC-certified and thus to use even for use in bicycles over 2500 € with full insurance. The overall grade of the test winner in the Faltschlössern amounts to 2.1. This is probably for such a compact, affordable and easy lock the absolute current maximum. When handling it comes to a score of 2.9 — this is, of course, the basic category of folding locks. They are only slightly immovable, but they also have their advantages. In terms of durability and pollutants, a compelling rating of 1.35 is an absolute first-rate value, especially durability. Overall, the Abus Bordo Granit X Plus 6500 is the test winner of Folding course an absolute top product. There is really nothing to complain about, as the fundamental inflexibility. The bicycle lock has a low weight, is very narrow and the price of under 100 € is definitely competitive. A top bicycle lock — if 85cm in rod format are sufficient.